Shipwreck is your quintessential sailor. He can splice a cable, plot a gunnery solution, navigate through shallow waters and keep the helm on a steady heading through the eye of a storm in twenty foot seas while eating a runny fried-egg sandwich with mayonnaise on it. He is a knowledgeable Chief Petty Officer with hands-on experience in most naval vessels up to frigate class. When boarding hostile ships or securing enemy strongholds, he's a man that can be counted on to put the enemy out of commission. Unfortunately, Shipwreck's incredibly arrogant attitude has cause trouble more than once with his teammates. To smooth things over, he and his pet parrot, Polly, have been transferred to the Tiger Force unit to handle a hostile situation in Brazil. Luckily for him, when something can't be resolved with force, he can fall back on a number of amusing tricks he performs with his tattoos to keep everyone entertained. Who hasn't heard of Marujo, the son of a coast guard patrolman who saved a military base? Born and raised on a maritime platform, the vast sea was his backyard and his only friends were the dolphins. After the young Marujo discovered Cobra setting underwater explosives on the remote Tiger Force base, the commandos summoned the boy, who was reputed to "talk to fish." 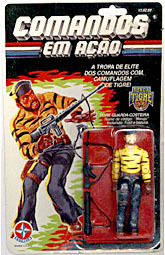 Later, Marujo joined Tiger Force - the elite squad composed of super commandos for missions that require superhuman ability. Since then, "the sea is not Cobra's!" Sure, okay then. The original Marujo wasn't just a repainted Shipwreck, and so this one isn't either. 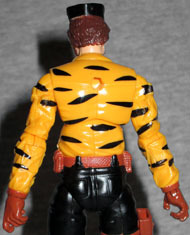 Sure, he's got Shipwreck's legs and Shipwreck's chest (not this one, the one that was used to create Topside last year), but he has long sleeves rather than short, just like Marujo - for Marujo, the arms came from Ripcord; for this figure, it's Lifeline. Using more modern arms means more modern articulation, so in addition to all the standard GI Joe articulation, he has the swivel/hinge wrists that the current figures have added lately. So, how can we be 100% sure that this is Shipwreck, and not Marujo? Marujo didn't have a parrot, and this figure does. This is the same mold of Polly that Rise of Cobra Shipwreck came with, with the beak open and the wings back. Shipwreck has a brown satchel slung over his shoulder, and it has two tiny pegs on the shoulder strap that Polly's feet can clip onto, so she can ride up there. How awesome is that! Beyond the bird and the bag, Shipwreck is armed with a big revolver, an M-16, and a spear gun, as well as the "hook on a string" whatsis we've seen before. 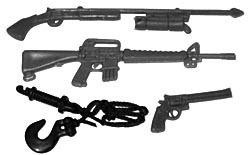 The guns are all grey, while the hook is black. The revolver fits in the holster on his right leg, but the rest of the things he'll just have to carry around. 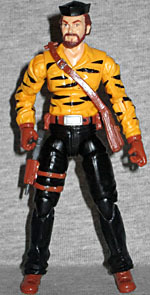 Seeing Shipwreck in the trademark yellow, brown and black of Tiger Force is an unusual sight (unless you lived in Brazil in the early '90s), but he makes for a good looking toy. And knowing what a jerk Shipwreck is, it'll be fun to imagine what happens when he gets to his assignment in Brazil and finds his exact double already living there.